— Sen. Joe Manchin (D-WV) is once again a small favorite in our ratings, moving from Toss-up to Leans Democratic in his race against state Attorney General Patrick Morrisey (R). 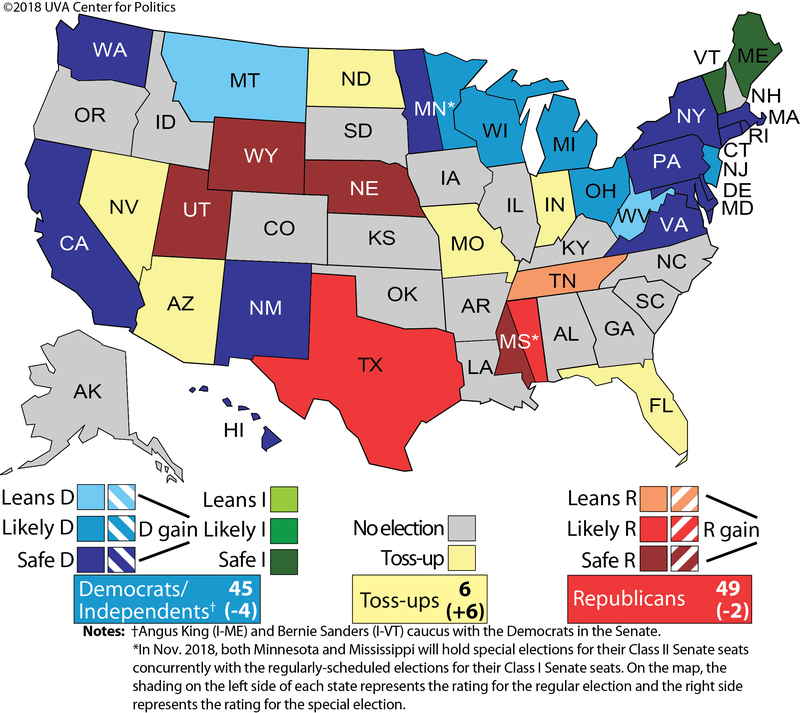 — That ratings change leaves six Toss-ups on the Crystal Ball Senate map: Democrats are defending seats held by incumbents in Florida, Indiana, Missouri and North Dakota, while Republicans are defending the seat held by Sen. Dean Heller (R-NV) and an open seat in Arizona. — Democrats likely have to sweep all of those Toss-ups to win a narrow 51-49 Senate majority. That is possible but — at this point — probably unlikely, so Republicans remain favored to hold the Senate. This week, the Crystal Ball offered a substantial update of its U.S. House ratings. Additionally, we have one ratings change in the U.S. Senate, a shift that also allows us to offer a fresh outlook for the elections in the upper chamber. Our one Senate ratings change comes in West Virginia, where incumbent Sen. Joe Manchin (D) faces state Attorney General Patrick Morrisey (R) in the general election. Just after the Mountain State’s May 8 primary, we moved the race from Leans Democratic to Toss-up, in part because GOP voters avoided making the potentially disastrous mistake of nominating former coal magnate Don Blankenship to face Manchin. Morrisey defeated Blankenship and Rep. Evan Jenkins (R, WV-3) in the Republican primary, and as a twice-elected statewide official, Morrisey has the résumé of someone capable of defeating Manchin. However, in the two or so months since our ratings shift, campaign developments and poll numbers show a race that leans in Manchin’s direction. As a result, we are moving the West Virginia Senate contest from Toss-up to Leans Democratic. On the polling front, there have been eight surveys released since the May primary. Of those, seven found Manchin ahead by at least seven points in head-to-head matchups with Morrisey. The lone exception was a Republican poll from WPA Intelligence two days after the May 8 nominating contest that showed Morrisey ahead 46%-44%. Another Republican pollster, Trafalgar, just found Manchin ahead by 10 percentage points last week. However, three others polls showing Manchin up were Democratic-sponsored surveys, so those pollsters also had direct skin in the game. Nonetheless, the three nonpartisan surveys of the race all tell the same story: Manchin appears to be ahead by more than a few points. Table 1 displays the nonpartisan polling data. Note: *Monmouth offered three different figures; this result comes from using its standard midterm likely voter model. Since mid-May, two pollsters have found Manchin with double-digit leads, and Monmouth University found Manchin ahead seven points in both its full sample and standard likely voter model (shown in Table 1) and ahead nine points in its “Democratic surge” model. Now, having just three nonpartisan surveys in about three months is certainly not ideal when it comes to analyzing data, and especially with just one live-phone poll (Monmouth). Yet some campaign developments, in conjunction with these surveys, supply further evidence that Manchin holds an edge in the contest. It is possible — though unclear how probable — that Blankenship will make the general election ballot as the Constitution Party nominee. A month ago, we examined Blankenship and how his third-party (or write-in) candidacy might impact the race. Should he contest the election, it’s unclear how much more Blankenship might hurt Morrisey than Manchin — Blankenship’s strongest areas in the May 8 primary actually overlap with Manchin’s (and other Mountain State Democrats’) traditional stronghold in southern West Virginia’s Third Congressional District. Still, Republicans would prefer Blankenship, a former GOP candidate, to not make the ballot. The former coal executive would surely serve as a distraction for Morrisey as the Republican nominee focuses his attacks on Manchin. As it is, Morrisey may find himself receiving less support from outside Republican groups than he expected. On Thursday, news broke that One Nation, a notable conservative nonprofit aligned with Senate Majority Leader Mitch McConnell (R-KY), had decided to cancel much of a $750,000 TV and radio ad campaign against Manchin while continuing its efforts in four other competitive Senate contests. Whether this is a one-off exit remains to be seen, but it is worrisome for Morrisey that an outside Republican group halted attack ads against ostensibly one of the most endangered Democratic incumbents in the country. The West Virginia race remains very competitive, but it seems that Manchin now has at least a slight edge. The new rating in the Mountain State means that we now favor Democrats to some extent in 22 of the 26 seats that they are defending in 2018. The other four Democratic-held seats in Florida, Indiana, Missouri, and North Dakota are all Toss-up races. Republicans are favored to some degree in seven of the nine seats they are defending, with Toss-up contests in GOP-held Arizona and Nevada. Overall, Republicans hold a slim 51-49 advantage in Congress’ upper chamber and it remains their chamber to lose. For Democrats to reverse the status quo and win their own 51-49 majority, they will likely need to retain every seat they currently control while picking up the open seat in Arizona and defeating Sen. Dean Heller (R-NV) in the Silver State (an even 50-50 split would allow the GOP to retain power via Vice President Mike Pence). It is possible that Democrats could win the open-seat race in Tennessee, where ex-Gov. Phil Bredesen (D) has led most polls against Rep. Marsha Blackburn (R, TN-7). However, the Volunteer State is a very conservative place these days and may prove to be a reach for Democrats by November. But even if Bredesen were to win while Democrats gained the two Toss-up races out west, the Democrats could still only afford to lose one of their most endangered seats (the toss-up races mentioned above plus Montana and West Virginia) and win a majority. While history is on the Democrats’ side — incumbents from the non-presidential party rarely lose in midterm cycles — there are five Democrats seeking reelection in states that President Donald Trump won by at least 18 points in 2016. That is a lot of red turf to defend, and Florida has become another serious battleground via Gov. Rick Scott’s (R) resurgent popularity and gigantic war chest against Sen. Bill Nelson (D-FL). The point is, Democrats need to either sweep all the Toss-ups to win a slender majority or pull off an upset in another state (like Tennessee). While either scenario could happen — for example, Democrats now hold around a seven-to-eight point lead in the generic ballot, suggesting a friendly environment — Republicans simply have a better chance of maintaining control of the Senate in 2018. Although the race for the House now tilts very slightly toward the Democrats, the GOP remains favored to retain the Senate.